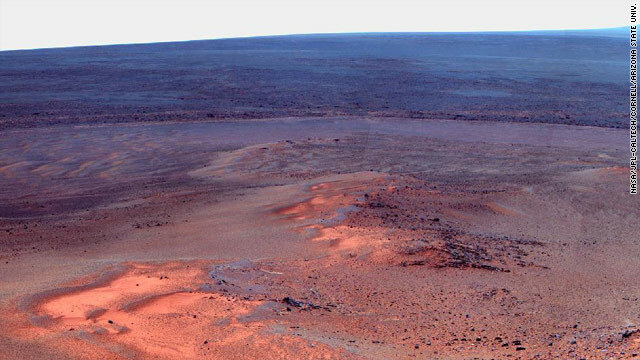 "This mosaic of images taken in mid-January 2012 shows the windswept vista northward (left) to northeastward (right) from the location where NASA's Mars Exploration Rover Opportunity is spending its fifth Martian winter, an outcrop informally named "Greeley Haven." Opportunity's Panoramic Camera (Pancam) took the component images as part of full-circle view being assembled from Greeley Haven. The view includes sand ripples and other wind-sculpted features in the foreground and mid-field. The northern edge of the the "Cape York" segment of the rim of Endeavour Crater forms an arc across the upper half of the scene. Opportunity landed on Mars on Jan. 25, 2004, Universal Time and EST (Jan. 24, PST). It has driven 21.4 miles (34.4 kilometers) as of its eighth anniversary on the planet. In late 2011, the rover team drove Opportunity up onto Greeley Haven to take advantage of the outcrop's sun-facing slope to boost output from the rover's dusty solar panels during the Martian winter. Research activities while at Greeley Haven include a radio-science investigation of the interior of Mars, inspections of mineral compositions and textures on the outcrop, and monitoring of wind-caused changes on scales from dunes to individual soil particles. The image combines exposures taken through Pancam filters centered on wavelengths of 753 nanometers (near infrared), 535 nanometers (green) and 432 nanometers (violet). The view is presented in false color to make some differences between materials easier to see." Thanks for pointing that out - we've made some changes that have affected some images & are working to fix.